With just about two and a half weeks until deployment, the team is working on testing and hardening all pieces of Augur — the UI, Augur Node, Augur App, and deployment of the core contracts. 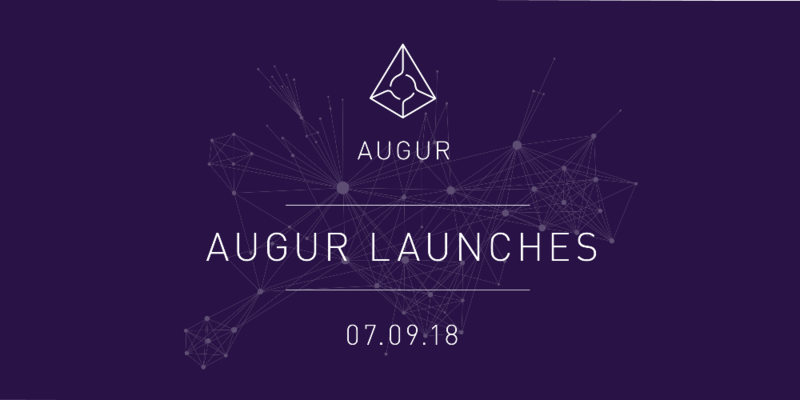 For users who wish to use Augur on the main network after deployment, they’ll need to download and run Augur App. Augur App will run Augur Node and the UI automatically for you on your machine. You will just need to point it to an active main net Ethereum node (Infura, QuickNode, local, etc). 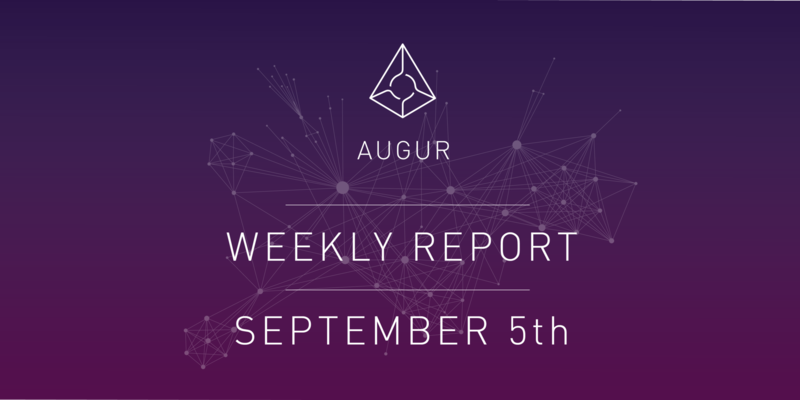 The backend team is researching all available scaling solutions for future updates to Augur, something the team plans to publish content about after deployment. The Augur community channels seem to be picking up in user activity. Come join us to participate in the discussions leading to launch. A reminder to all Ether/ForkDelta, IDEX, and OasisDEX users — withdraw your REP from the exchange contract prior to July 9th @ 11:01AM PT in order to successfully receive new REP tokens in the migration. If you do not have REP in a decentralized exchange contract —there is nothing you need to do for deployment and the migration. The bounty program is rolling and accepting all submissions. Test out the UI at dev.augur.net on Rinkeby, take a look at our Github, and let us know your feedback! 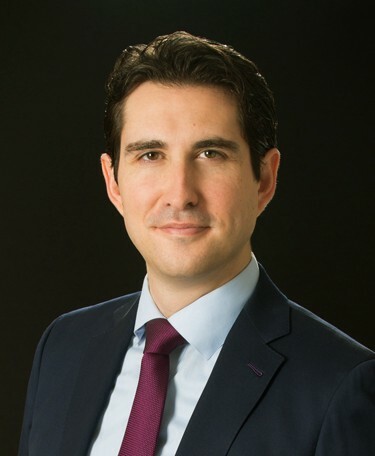 Today, we are pleased to share that Marco Santori will be joining the Forecast Foundation advisory board. The Forecast Foundation has been working with Marco since 2015, and over the years he’s provided invaluable input and feedback to the Forecast Foundation team. Marco is President and Chief Legal Officer of Blockchain.info. Previously partner at Cooley LLC, he is also the Legal Ambassador for the Delaware Blockchain Initiative, and an advisor to the International Monetary Fund. He’s been called “The Dean of Digital Currency Lawyers” by the American Banker, and counseled on compliance with and disputes over money services, securities and derivatives laws. The Forecast Foundation is delighted to have Marco joining the advisory board. Marco will be assisting the team with strategic advice and guidance over the coming months. You can out more about Marco on Twitter or at his website. The REP migration has been successfully completed. New production REP has been minted to all 56,338 unique accounts that held REP at the time of 11:01AM PT on July 9th, 2018. The transaction that froze the old REP contract indefinitely can be seen here. Exchanges, wallet providers, block explorers and other services that interact with REP will be updating the REP contract address over the coming day. If you’re using a service that is not reflecting the new REP token contract, please send them a message and let them know. REP transfers will cost slightly more gas than transfers on the old contract due to additional logging. Please be sure to estimate gas properly when sending REP token transfers. Note : The new REP token contract was created by another Augur contract, and the source code cannot currently be verified by EtherScan. The new REP token source code can be found on the Augur Core GitHub repository, located here. If you‘d like to verify the new REP token contract manually, a technical explanation can be found here. The REP contract is also no longer pauseable, meaning all future updates to Augur will require a new Augur contract deployment, and a manual opt-in migration of REP (aka, an opt-in hard fork). 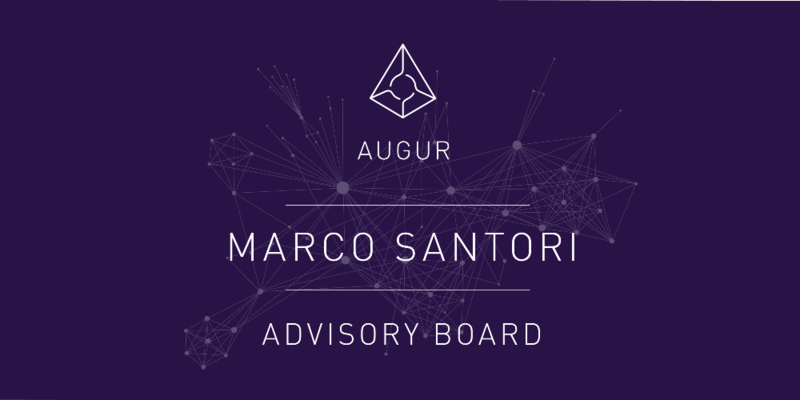 The final release of Augur App has been published to the Augur Github repository below. Users must download Augur App and run it locally on their machine. 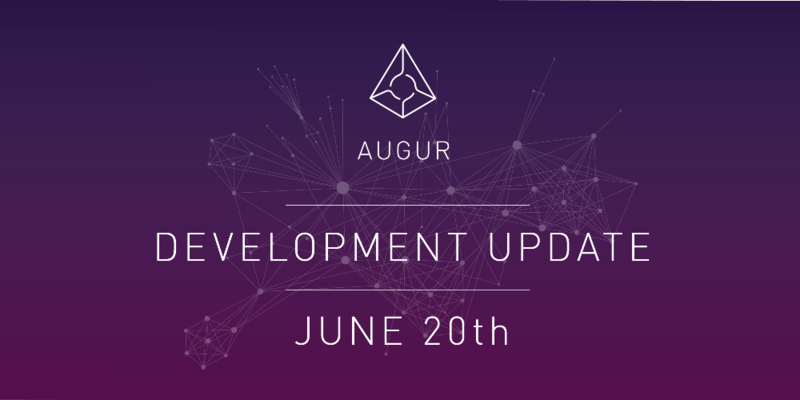 There is no hosted or centrally served deployment of the Augur reference user interface or Augur Node that connects to the Augur protocols contracts on the main Ethereum network. Users must run these services and software themselves. The release notes include instructions on how to run Augur App. Augur App bundles the Augur reference user interface and Augur Node together into a double-click deploy process locally on your machine, and allows you to connect to an Ethereum node of your choice. This can be a locally run Ethereum node, or a remote node service such as Infura. Please report all bugs and issues as GitHub Issues in their respective repositories so the Augur community can assess, manage and fix them. Note: If you’ve installed a previous pre-release of Augur App locally on your machine, you will need to clear your configuration file in order to properly run the new Augur App and connect to the main Ethereum network. The location of the configuration file for each operating system can be found in the Augur App release notes. It is highly recommended and encouraged that users read the Augur FAQ and disclaimer prior to interacting with the Augur protocol on the main Ethereum network. The words of support received today are highly appreciated. 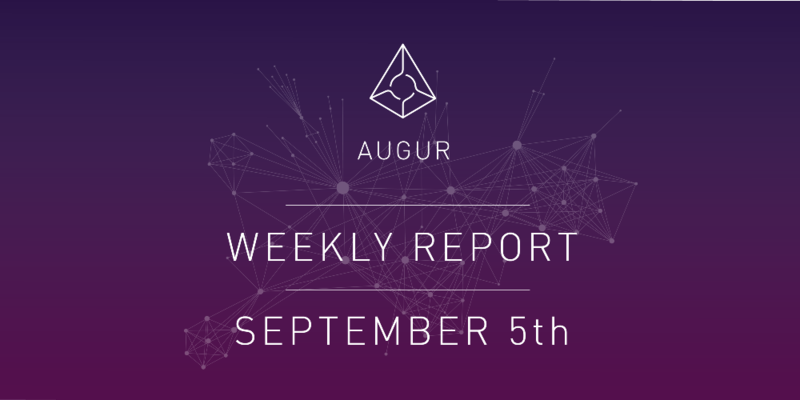 Augur couldn’t have been built and deployed if it wasn’t for the hundreds of unique contributors, community members, software developers, hackers and advocates who have backed and worked relentlessly towards this vision for the past three years. Please bear with the software developers and maintainers in the early days, as there will undoubtedly be compatibility issues, bugs, and a learning curve for new users of decentralized applications. You can assist by jumping into Github issues and provide initial triage or fixes, answer others’ questions in the Augur Discord or Subreddit, or by providing helpful content for others, just as some examples. Augur is built from the ground up to be owned and operated by the people that use it. You don’t need to be an all star software engineer or specific type of power user to push the Augur protocol forward, anyone can. Make sure to post your wish list for Augur v2 on Reddit, and don’t forget to apply as a hacker for Eth San Francisco. Look over Augur’s documentation & API to get some ideas on what to build. By giving people a financial incentive to reveal their knowledge, you get very good predictions. If you happen to be at Eth Berlin this weekend, show some love to the Veil team and be sure to check out their alpha built on top of Augur and 0x. Reporters.chat pushed a few new updates. Why is no one really using Augur? Another patch release, packed full of fixes and some cool new features! IMPORTANT NOTE: The community provided mainnet node has been removed as the default since it is not currently functional. Users will need to connect to a full node locally or find a trusted full node that is hosted by a third party. We are actively pursuing better alternatives. Local Light Node has been made the default, but it is still experimental and should be used only after a full sync.